This is it. These are the products you’ve been looking for. 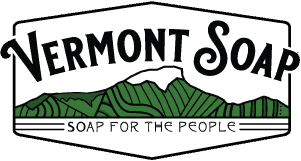 Since 1992, Vermont Soap has been making the finest handmade bar soaps for sensitive skin and natural personal care products. Replacing yucky stuff with yummy stuff! Turn your home into a nontoxic household with Castile Liquid Soap and nontoxic cleaning supplies from Vermont Soap. Experience the soothing action of shea butter with our moisturizers and salves. Natural solutions to everyday problems. Put essential oils to work and control body odor with our organic deodorants. Are you a business? Our wholesale program has low minimums and easy terms. Let us be your soap factory! When it comes to organic pet and people products from shea butter to deodorant to soap, Vermont Soap is the private label soap manufacturer you have been looking for. All orders over $75 shipped to the lower 48 (Contiguous US) ship free of charge. Signup for eSpecials and be the first to know every week of our special deals. Save up to 50%! Visit our Discount Factory Outlet and Soap Museum where you can buy soap by the pound! Click here for hours and directions. Have a question about soaps, organic products or chemical ingredients? He’s got the answers! Ask your question. Browse our catalog using the menu above. When you're ready, login or create an account to access wholesale pricing and place your order. Enter here for bulk unpackaged organic soap bars, liquids, gels, foamers, shea butter and more. You must login or create an account to enter. Let Vermont Soap be your organic soap factory. Custom formulation, private labeling and bulk product made to your specifications. Does brushing your teeth actually spread gum disease?